“I bought a one-way ticket to Playa, knowing it would be my new home.” Gary says that Playa del Carmen has everything he needs to live a great life. Residents of Playa enjoy the recreational benefits of an offshore reef, which extends the entire length of Mexico‘s Caribbean coast and beyond, providing the perfect backdrop for boating, fishing, scuba and snorkelling year-round. “The water is 20 different shades of brilliant blue and turquoise and so clear you can see a turtle swimming 60 metres away,” says Gary. 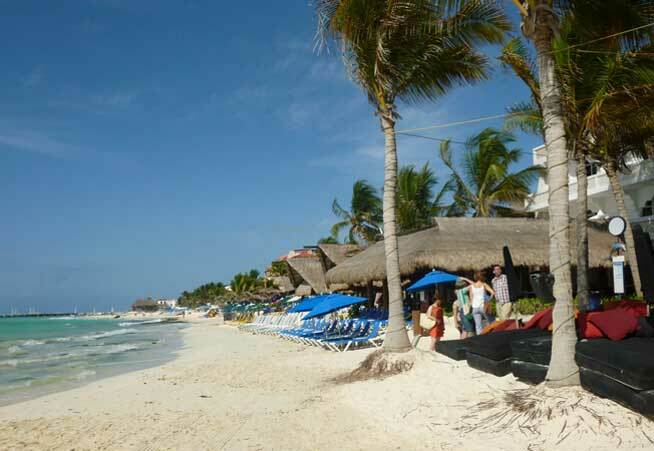 Gary’s passion for Playa del Carmen has remained strong over the years. “If we want an inexpensive lunch, we can grab a couple of tacos and a cold drink for about $4. The city has an international flavour, so all kinds of food is available. There are tons of wonderful restaurants with fresh seafood if that’s what you want. I just heard about a great New Orleans rib shack where the ribs are slow-cooked and the meat falls off the bone. “There is new construction happening everywhere. Playa del Carmen isn’t the secret it once was. Investors from all over are buying here now and you can definitely see an increase in the traffic from a few years ago, but that doesn’t bother us one bit. Even though Playa is growing, it still feels like a small town,” said Gary. “We have a two-storey house on the northeast side of Playa, two bedrooms and one bathroom with a nice yard, which is great for the animals. The house is paid for but would rent for about $540 to $670 per month if we were renting it. It’s close to everything so walking is easy. Gary says their overall budget is between $1,200 to $1,340 monthly.